The Pruess Range is a subrange of the Peale Mountains and includes its main escarpment as well as Dry Ridge, the Gannett Hills, Freeman Ridge and the Sheep Creek Hills. The range forms the southern end of the Peale Mountains and is roughly 25 miles from north to south and 12 miles from east to west. The Preuss Range is named for Charles Preuss (1803-1854), the talented German born cartographer/artist on John C Fremont’s 1843 expedition thru southern Idaho. As a result of Preuss’s 1850 map of the Oregon Trail thru Idaho, the geologist Albert C Peale in 1879 named a prominent Idaho mountain range in his honor. Meade Peak is the highest point in the range. (Thanks to Rick Baugher for this entry.) 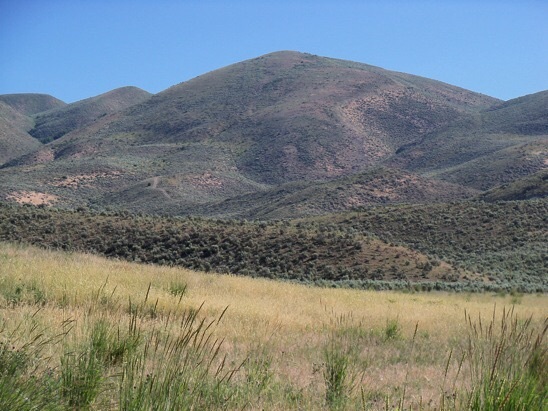 The Sheep Creek Hills are a southern extension of the Preuss Range in far southeastern Idaho. Boundaries are Montpelier Canyon to the north, Thomas Fork Valley and Wyoming to the east, Bear River to the south, and Bear Lake Valley on the west. The Oregon Trail crossed the southern section of Sheep Creek Hills. 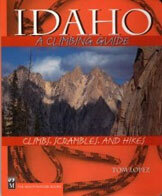 For thousands of wagon bound emigrants of the 1840’s-1850’s this was their Idaho point of entry. Weary travelers were ‘welcomed’ with a daunting ascent & descent of ‘Big Hill’, one of the most difficult sections on the entire Oregon Trail. The Sheep Creek Hills highpoint, el 7826′. prominence 886′, is at the north end of this hill group. It rises east of the town of Montpelier and is adorned with communications equipment. (Thanks to Rick Baugher for this entry.) Dry Ridge is one of the middle fingers that extend northward from the ‘wrist’ of the Preuss Range (Peale Mountains). Schmid Ridge parallels to the west; while the more substantial Webster Range, defining the perimeter of Idaho’s Southeast Highlands, lies to the east. Dry Ridge is difficult to catalog. Much of its 20 mile length is and has been mined for phosphate. Yet, it has pockets of wild spots among its mixture of forest and brush. In the course of exploring the 9 ranked peaks on Dry Ridge, two, ‘Hornet Peak’ 8623/393′ and ‘Maybe Peak’ 8210/520′ were found to be unoccupied as late as 2014. The question about where Dry Ridge begins in the south is open to debate. Does Dry Ridge start at a political boundary- the Bear Lake/Caribou County line? Or, is the southern boundary determined physically as the ridge dividing Georgetown Canyon? Various maps suggest different points of view. 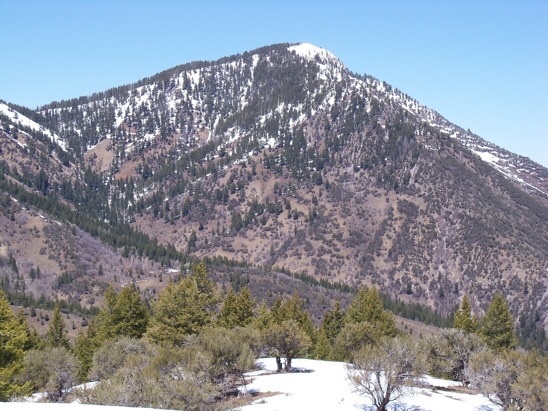 If we choose the first option, then ‘Dry Ridge Peak’ 8975/925′ is the Dry Ridge highpoint. The second choice makes the highpoint the more visually prominent Hawks Peak 9079/1299′. (Once, again, thanks to Rick for the following.) The Gannett Hills straddles the Idaho-Wyoming line. They are equally shared. According to US Geologist George Rogers Mansfield, who named this feature in 1916, the Gannett Hills honor the eminent geographer Henry Gannett (1846-1914) who as topographer with the Hayden Survey mapped this region ca 1877. Mansfield stated the Gannett Hills are 27 miles in length and have a maximum width of 14 miles. These hills are bounded by Star Valley and US 89 on the east; and Preuss Creek and Crow Creek on the west. Gannett Hills are sandwiched between Preuss Range (Idaho side) and Salt River Range (Wyoming). 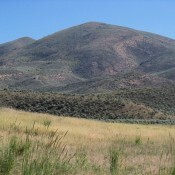 Mansfield identified Red Mountain in Idaho as the highest peak in the Gannett Hills. His 1909 elevation was 8799′. Current reading is 8809′. Google Maps, however, shows a ‘Gannett Hills HP’ on the Wyoming side. This corresponds to ‘Crossley Benchmark’ el 8792’/1052′. A good portion of Gannett Hills is in roadless hard to reach country, within Bridger and Caribou national forests. Using the above definition, there are 4 ranked peaks on Freeman Ridge. The ridge highpoint el 8716′, prominence 946′, has been dubbed ‘Spike Peak‘. Several additional summits crowd this headwaters area of Blackfoot River in adjoining Webster Range and Preuss Range.